BelarusDigest > All > Are There Any Oligarchs in Belarus? On Monday, Switzerland joined the EU sanctions against Belarusian citizens and firms believed to support dictatorship. Most of these firms belong to Vladimir Peftiev. Belarusian and international media often portray him as having a significant role in the regime. That prompted the EU to punish him and some other businessmen for their support of Lukashenka. However, the significance and influence of the so called Belarusian "oligarchs" should not be exaggerated. While in Russia and Ukraine oligarchs form a clique of business moguls which could seriously influence the government, Belarusian "oligarchs" are much poorer and have hardly any clout in national politics. In reality they are just replaceable managers rather than stakeholders of the Belarusian regime. The Belarusian ruler brings them to the top, then puts in prisons, forgives them and uses them again as he deems proper. Their function is to run profitable firms and take care of whatever the regime permits them to do. Three of the "oligarchs" became prominent as being the most important for the regime – Uladzimir Peftiev, Yury Czyzh and Alexander Shakucin. Andrzej Poczobut of Polish Gazeta Wyborcza called Peftiev “doubtless No.1”. Independent Belarusian media estimated his property at about $1bn. Although the basis for such estimate is unclear they nicknamed him “Lukashenka's purse”. Media can easily assign Peftiev the role of the main villain because he worked in arms trade. Lukashenka inherited Peftiev with his lucrative military export business from previous Belarusian leader Vyachaslau Kebich. Peftiev is also doing business with both sons of the current ruler. In addition to arms trade, he has interests in alcohol production, the lottery and various branches in construction. He has probably the most international interests among all Belarusian “oligarchs” as his firms own property and operate abroad, in Malta, Austria, the UAE and India, according to Internet daily Ezhednevnik. Peftiev himself prefers to spend most of his time on Malta rather then residing in Belarus. When in July 2011 the EU put on a travel ban list, Lukashenka publicly swore that he had seen Peftiev “not more than three times” and had not taken money from him. Other “oligarchs” are by far much poorer. The 48-years old Yury Chyzh frequently appears along Lukashenka at public events. Chyzh owns the Triple Corporation which is famous in Belarus for its soft drinks. He also has extensive business interests in construction as well as Russian oil imports, reprocessing and exports. Thus, Slovenia vetoed putting a travel ban on Czyzh as a Slovenian firm is now building together with Chyzh a Kempinski Hotel in Minsk. The other international interests of Czyzh also include biofuel production in Lithuania and Latvia. The wealth and the role of third “key oligarch” 52-years old Alexander Shakutin is very questionable. He chairs the board of directors for Amkodor – a corporation which works in road construction, cleaning and forestry machinery. He is also one of Amkador's shareholders. But his role in Amkodor probably is probably just a formal position because the firm effectively belongs to a Nepalese businessman. Trained as a physician, Shakutin worked in health system and had his own medical equipment business. Then, his old Nepalese fellow student from the Minsk Medical Institute brought Shakutin into the management of Amkodor in early 2000s to consolidate his control over the firm. The logic of Shakutin's companion is clear: even today the Belarusian state does not like too many foreign faces in directorial positions. Shakutin has the prestigious yet completely unimportant regalia of being a member of the higher chamber of the Parliament. That chamber is even weaker than the lower one which has no power whatsoever. He also has a position on the board of one of the pro-Lukashenka movements called Belaya Rus. This movement has absolutely no function in current Belarusian politics. Other “oligarchs” own relatively big businesses by Belarusian standards but can hardly be called accomplices of the dictator. None of them has guarantees of their personal security or security of their businesses. Last autumn, the KGB arrested Viktar Shaucou, a big businessman with interests in banking and construction. Shaucou was charged with committing financial offences in construction projects undertaken by his firm in Venezuela. Since 1990s, he actively supported Belarusian foreign policy aimed at establishing links with developing countries which involved sometimes rather sensitive deals. His Trustbank – back then called Infobank – worked with Saddam's Iraq and has been on a list of the United States' sanctions because of these dealings. Imprisonment is an occupational hazard of all Belarusian big businessmen, officials and directors of huge state factories under Lukashenka. 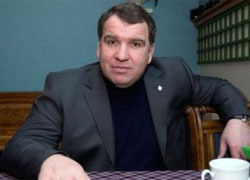 In 2007, the KGB arrested Alyaksandar Barouski, director of the state conglomerate Belnaftakhim, for financial irregularities in oil industry – reprocessing imported Russian oil for Western markets. In 2008, Barouski was found guilty and got 5 years of imprisonment. Lukashenka pardoned him nine month later and in 2009 appointed him as general director of one of the largest Belarusian state owned enterprises – Minsk Automobile Works (MAZ). The director of the Belarusian Institute of Strategic Studies Alaksiej Pikulik once described Belarusian regime as a kind of joint-stock company. Its shareholders support Lukashenka and get their dividends for it. But, “there is no tradition of promising shareholders freedom and independence instead of dividends.” And “oligarchs” are just bigger but are far from being controlling shareholders of the regime. Of course, they run some business enterprises both for their own profits and on behalf of the regime. That is the model of state capitalism. It emerges with the fusion of the political regime and business, though the state remains the dominant party and allows the oligarchs to take only so much. At the same time, the state redirects some of the profits gained to economic development of the country as a whole. Belarusian officials like to refer to authoritarian regimes of South-East Asia like Singapore or Malaysia which have had such models for decades. But they could also look at Putin's Russia and Nazarbayev's Kazakhstan where this kind of relationship between government and business has been successfully implemented quite recently. Actually, it could not be otherwise. There is no real private property in the country. There are no functioning legal norms or courts which would allow you to protect private property of any significance without approval of the regime. Both rich and poor are equal in this regard. All Belarusian "oligarchs" are just managers which can be replaced and stripped of their property at any moment. That means that sanctions against “oligarchs” are a nice gesture but their implications are doubtful. They do not threaten the foundations of the regime. Rather, they support and cement the current situation when big businessmen are just servants of the regime with no escape. Moreover, as example of Shakutin shows the list of biggest the “oligarchs” may contain significant mistakes. The sanctions against oligarchs only pay lip service to democracy or human rights without actually promoting them. The Ambassadors of Poland, Lithuania and Sweden have returned to Minsk and their colleagues are on the way to the Belarusian capital. It seems that EU-Belarus relations have broken the deadlock, but they remain difficult and the EU has few carrots to offer its restive authoritarian neighbour. Unlike countries like Moldova and Armenia, Belarus is increasingly integrating into the Eurasian Economic Union without any serious interest in European integration. The reason for this is oil and its financial dependence on Russia. If the EU wants to establish democracy in Belarus, it should offer a comprehensive package of assistance in reforms. But even if Belarus decides to take European path, it will take at least 3-4 years to reach the same level of relations as exists with Georgia or Ukraine. And there are plenty of obstacles: from WTO membership to an obligation to secure permission from the yet to be established Eurasian Commission. The planned return of all EU ambassadors to Belarus marks the end of the worst EU-Belarus political conflict since it regained its independence. Swedish Foreign Minister Carl Bildt says that the EU is ready to restore the status-quo in its relations with Belarus that existed before the notorious presidential election in December 2010. Unfortunately such a return to the year 2010 is no longer possible because Belarus is increasingly integrating into the new Eurasian Economic Union advanced by Russian president-elect Vladimir Putin. He offered significant discounted oil and gas supplies to Belarus which helped the country survive the economic crisis that began in April-May 2011. Recently Standard & Poor's has even revised the outlook on Belarus from "negative" to "stable" despite pessimistic forecasts of local analysts. Russia managed to obtain the main Belarusian gas pipeline tranpsortation system (Beltransgaz) in return for assistance in hard times. Moreover, approximately 70% of all enterprises in Belarus are still state-owned. The country plans to privatise 133 of them with the total amount of $2.5bn this year. And guess who will own most of them soon? That's right — their big neighbour to the east. At the same time the majority of Eastern Partnership countries, in particular Moldova, Georgia, Armenia and Ukraine, conduct negotiations with the EU under the Association Agreement and Deep and Comprehensive Free Trade Area (DCFTA or Free Trade Agreement). The Free Trade Agreement is key to understanding why Ukraine does not want to participate fully in the creation of the Customs Union with Russia, Belarus and Kazakhstan. This type of agreement implies progressive liberalisation of bilateral trade through lifting tariff and non-tariff barriers. It also extends to legislative and administrative regulation of trade. As a result these countries should approximate to the EU standards as closely as possible, as if they were Norway or Switzerland. The Free Trade Agreement is the main "carrot" of the Eastern Partnership as it opens the EU Single Market for Eastern Partnership countries. Their advantages are obvious, because the EU GDP by purchasing power parity is almost seven times greater than the GDP of the Russia-led Customs Union. And economic integration is more beneficial with prosperous countries, not with oil-rich backward Russia and Kazakhstan which want to protect themselves from foreign competition. If Ukraine is a member of the Eurasian Economic Union, it would have to pay high levels of compensation for its trade partners outside the Union as the country has lower import tariffs under its WTO obligations. What is more important, a member of the Eurasian Economic Union does not have a right to conduct separate trade negotiations with any countries. Instead, it should ask for permission of the supranational Eurasian Economic Commission and take into account economic interests of all member states. It means that in practice Belarus can not launch negotiations with the EU on Free Trade Agreement without Russian consent even if all political prisoners are free. Why Belarus Chose Eurasian Integration? As many other Eastern Partnership countries, Belarus has at least 25% EU share in its trade balance. As opposed to them, petrochemicals amount to more than 65% of Belarusian export to the EU countries. Only Azerbaijan surpasses Belarus with its 99.5% share of oil and gas in export to the EU. Whether it is a coincidence or not, both countries are authoritarian and are not WTO members. However, while Azerbaijan has its own oil, Belarus mostly relies on Russian oil producers. In January 2012 its export to the EU increased fourfold from $439m to $1.74bn as compared with the previous year due to favourable conditions of oil supplies from Russia. But the significant improvement in EU-Belarus relations on a political level may make Russia angry and thus put an end to its oil paradise. Benefits from reduced import tariffs in trade with the EU will not cover losses from a decrease in the amount of oil refined in Belarus. The reason for Eurasian integration is very simple: Belarus is badly dependent on Russia. Another reason for choosing the Eurasian integration is the unwillingness to undertake any significant reforms. 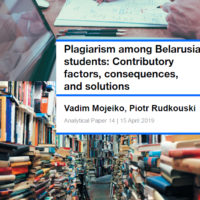 Belarusian authorities would like to maintain the existing political and economic status quo for as long as they can. Most of the Eastern Partnership countries on the contrary intend to improve their administrative and legislative systems according to European standards in order to attract foreign investments. It clearly illustrates the dilemma that the Belarusian ruler faced in 2010. On the one hand, he could follow the path of modernization and liberalisation. It was a sound strategy, but it demanded large sums of money and could have caused social and political instability. On the other hand, he could restore deteriorating relations with the Russians and reinstate their generous support in exchange for promises of future concessions. Finally, Lukashenka prefers short-term benefits over long-term advantages and is unwilling to invest money in the democratic future of Belarus. Belarusian authorities are forced to rely on Russian support to survive, but Russia may soon get control over all strategic assets in the country for cheap. Thus participation in the Eurasian Union poses a threat to Belarusian sovereignty. But it also has at least one positive consequence – Belarus will be forced to become a WTO member and this will consequently encourage authorities to make economic reforms. Russia does not guarantee that it will keep its oil and gas discounts for a very long time. Sooner or later Belarusian authorities will face the prospect of the collapse of their economic model. At that moment the EU should be ready to offer Belarus a comprehensive package of financial and technical assistance in reforms and enter into a dialogue with authorities and businessmen on the future development of the country.